Rising Craze of Multiple or Midi Rings With Girls. There is a craze for multiple rings sweeping across the world for the girls. 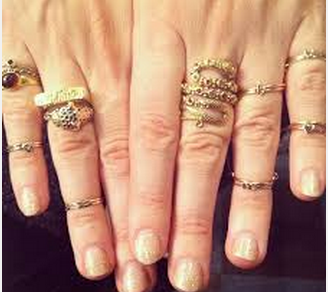 The primary rings are worn on different fingers, along with the midi rings of different metals. The rings of plain metal and gemstones with attractive designs are the order of the day. Earlier they were wearing only a single gold ring but the trend has changed these days. Today the rings are adorned for all the fingers with different designs. The young girls are starting to wear up to four rings on a single finger; being their style statement today. They may be of gold, silver, diamond or semiprecious rings. Now, Big Sized Colored Rings. In the changed scenario of fashion, the girls are highly conscious of accessories. They are extraordinarily consciousness for the rings as well. They like to purchase and wear big colored ring on the wrist. The wrist ring can be of any color stones’ red, blue, green or sapphire. The girls of 20 + age do not hesitate to buy such rings. Plain diamond or small diamonds embedded with semi-precious stones all around are in demand today. Classic colors or designs are much appreciated. These days wearing five to six rings at a time are trendy. Connected rings fashion is here again. Cocktail rings or colored multi rings are in demand, at the same time, the shining rings are the in trend as well. Delicate chains and connected rings are making a come back. Western wear and or sari and multiple rings concept is here to stay. The girls should take care that rings have the same color theme and styling. If the rings are of silver, they should ensure that all the rings are of silver, if of metal then all to be of silver as well. The ring color should match the outfit, the color of stone rings need to be of same matching color. If one is a big signature ring, then all the rest rings ought to be small. If the ring matches the color of the outfit, then all other rings should have the same color of stones. That way the rings as accessories will give an elegant look. New concept is the first choice. In these days of fashion, the young girls are conscious and fond of wearing with cocktail ring other multiple rings. Rings are essential accessories now for women. In the option of heavy metal necklace the ring or bracelet, they are choosing cocktail ring or multiple rings. Whether party girl or working girl, they are using the rings for multi-purpose. That is why, on demand, multipurpose rings are being designed to wear in different fingers. Such rings may be worn in different fingers or on folding wear on a single finger.